Granite Brackets. Hidden Countertop Brackets and Countertop Supports! Granite Brackets and Countertop Brackets by Centerline add hidden support for overhangs, center-levered bar tops, kitchen islands, shelves and more. Centerline Brackets has moved into our new facility! Due to the closure while moving we have a backlog of orders and are working as quickly as possible to fulfill them. Please allow 3-4 days for your order to ship, not including the weekend. 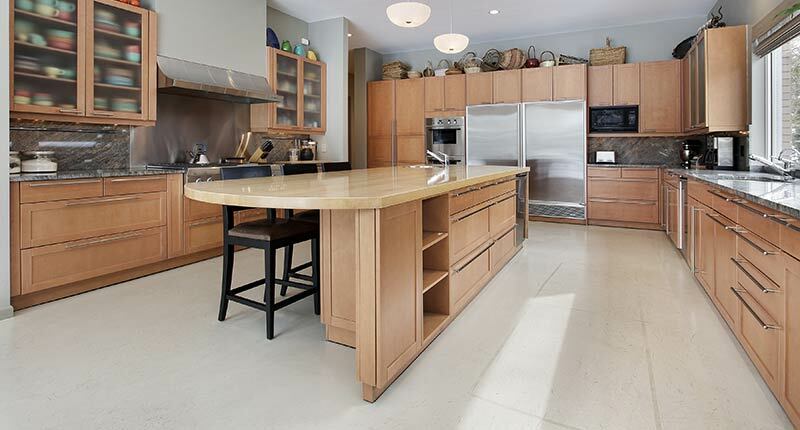 Countertops made from granite, marble, quartz, Silestone, Corian and even heavy butcher block are becoming very popular. Kitchen designers and homeowners are pushing the structural limits of these solid surface materials as they become aware of new trends and materials available to them. 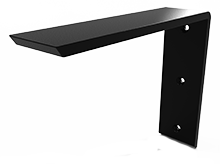 Accordingly Centerline Brackets specializes in manufacturing high quality countertop supports designed to safely support and bracket commercial and residential applications. 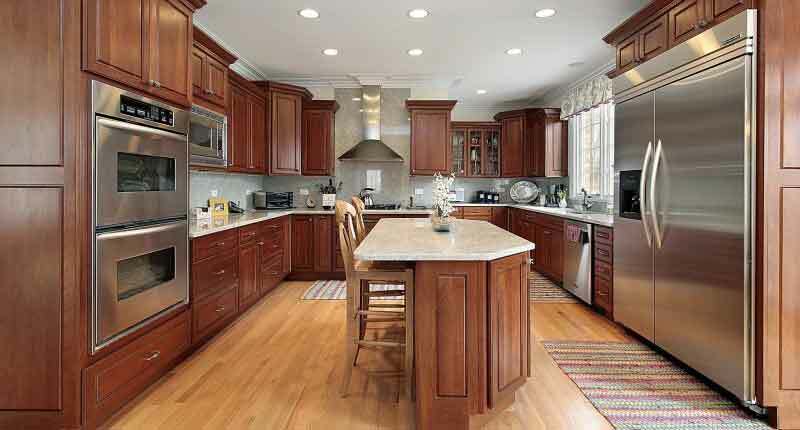 Countertop Brackets by Centerline Brackets are part of this new movement. Our countertop support brackets are the gold standard in countertop brackets and used in thousands of kitchens across the country. Traditional supports such as wooden corbels, standard legs and typical angled braces are giving way to “Hidden” Granite Brackets giving your kitchen a more spacious design. Have a rush job? We are not a re-seller - no waiting on a shipment from China for our stock - we manufacture all of our products here in the USA with quality American made steel and labor. Most of our products are in stock and ship the same day if ordered by 12 PM EST Monday - Friday. Orders placed after 12 PM EST on Friday or during the weekend will ship on the following Monday. If you have time sensitive needs just call us at 888-960-3854 and let us know. Need a custom product? We maintain a full-service shop and can manufacture custom products to your specification or design a product to meet your specific needs. Turn around is often the same the day. 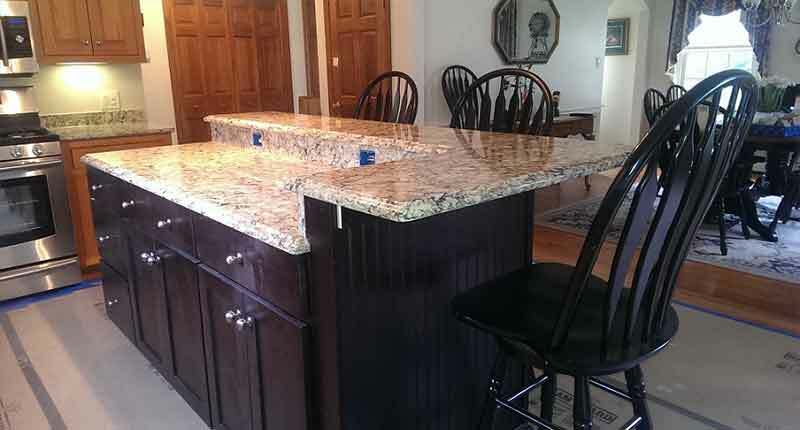 SUPPORT - and strengthen your granite countertops helping you avoid potentially costly and dangerous breaks. HIDDEN - They provide a more spacious and open looking looking environment. 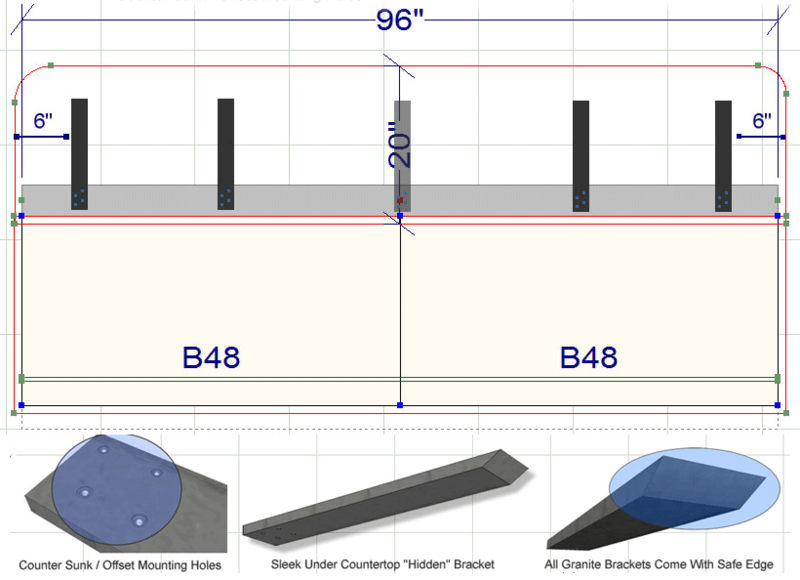 TOUGH - Most of our brackets are made of 1/2 inch steel and have multiple mounting points. SAFE - Our brackets mount directly to your knee / pony wall providing a strong and stable structure for your granite countertop to rest on. THIN - no corbels or braces for you or your guests to hit their knees on. EASY - to install. Learn how to properly install our brackets by following our easy to understand tutorials. INEXPENSIVE - typically much less expensive than corbels. At Centerline we take security very seriously - you should too. The link above validates our services through Authorize.net - The world leader in ecommerce processing. See just how simple it is to install our Countertop Brackets! 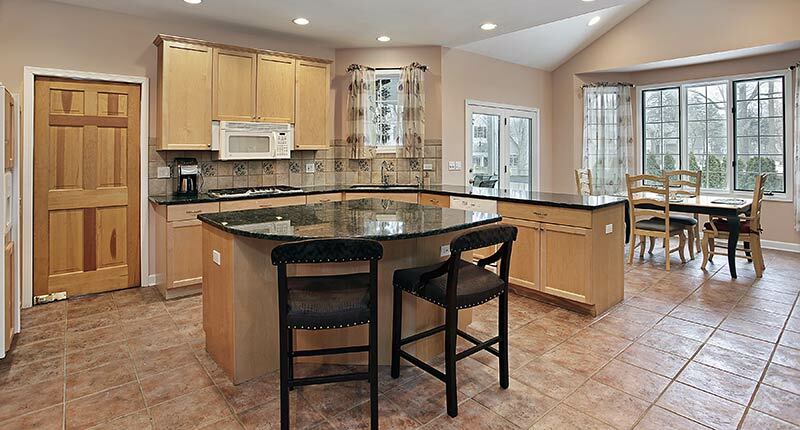 The Countertop Island Support Bracket is designed to support Island overhangs and breakfast bars. Our Front Mounting Countertop Support Bracket for granite or other solid surface applications are designed to be mounted directly to a stud or used with a backing plate in either an existing installation or in a new installation. Our Front Mounting PLUS Countertop Support Bracket is a gusseted version of our Front Mounting Bracket designed for overhangs, shower seats and other applications that require additional support. These brackets are designed to be mounted directly to a stud or used with a backing plate in either an existing installation or in a new installation. 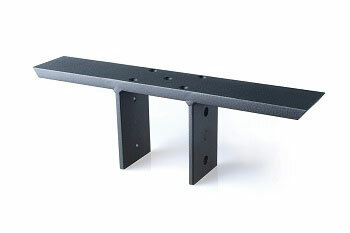 The Standard Plus Hidden Granite Bracket countertop support makes for a fast and easy installation. Mounted on the top and back of your knee / pony wall for extra support and affixed with 4 #12 wood screws (included with the bracket). This bracket provides excellent support and prevents the countertop from tipping over or cracking when leaned on. The Forward L Hidden Granite Bracket countertop support is used when you need to get that extra grip on a structure or knee wall. The bracket mounts to the top and rear of the knee wall with #12 wood screws (included with the bracket). This is our preferred countertop support bracket for applications that require support that evenly spans both sided of a knee wall or other structure. What length granite bracket will you need? Typically the bracket will be the same length as the overhang. The drawing below shows a 96 inch countertop with a 16 inch overhang past the knee wall. 20 inches total. The length of the bracket should include the width of the knee wall. In most instances the knee wall is 4 inches wide. The overhang plus the knee wall = 20 inches. 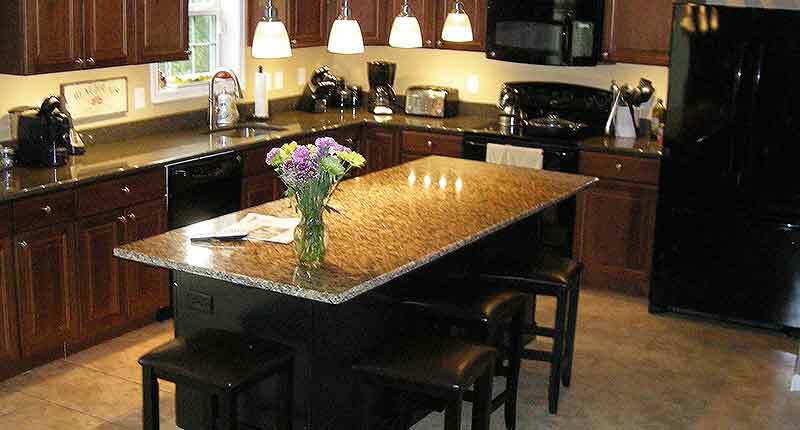 Granite Brackets should be set three - four inches back from the edge of the granite counter top to insure they are hidden from view. So - 20 inches - 4 inches = 16 inch brackets. If your knee wall is made from 2 x 6s then be sure to adjust your size to accommodate the extra 2 inches. How many granite brackets will you need? 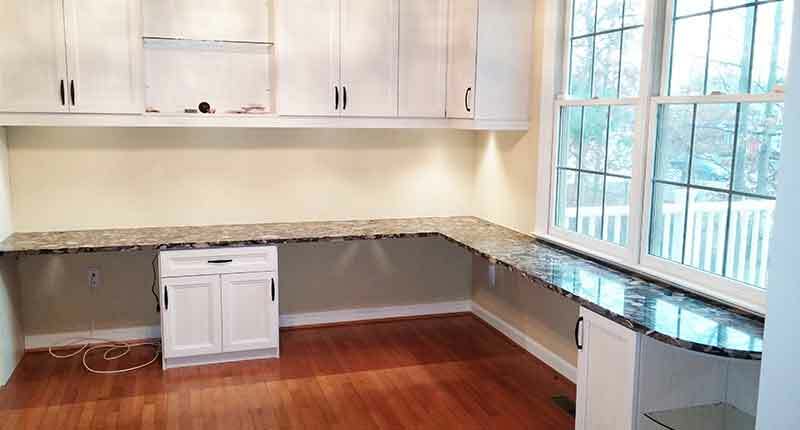 Countertop brackets are generally spaced 18 - 24 inches apart. Start with a bracket at each end of the countertop set 4 - 6 inches away from the end. Now measure the space left - in this instance we have 96 inches minus the the placement of the first two brackets placed 6 inches from the edge along with the width of the brackets (2.5 inches each) for a total of 79 inches left. 79 inches divided by 24 inches = 3.2 brackets. 3 granite brackets would be required for the space left. Order two granite brackets for the ends and three granite brackets for the middle for total of five countertop brackets. Dont forget to check out our countertop support bracket installation guide.